Please click on the book to learn more or to order. If you can leave a review...thank you! Honest reviews are important for emerging authors and greatly appreciated. 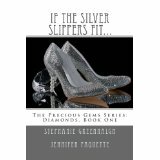 "If The Silver Slippers Fit..." , a 2Muses project, was co-authored with fellow writer, friend and muse, ﻿Stephanie Greenhalgh﻿. It is a tale of two feisty witches, two wickedly impossible dilemmas, two modern day realms infused with a little mischievous magic and one pair of totally awesome and very sassy shoes! A beautiful vixen goddess finds herself the pawn between the king and queen of Mt. Olympus as she is banished to Agnostos, The Triangle of the Unknown, a watery prison that strips her of her immortality. Near death, she discovers an ancient Titan curse which leads to a mysterious ocean portal. To maintain their status as supreme rulers, the bickering Olympians must enter the abyss and work together to find and conquer what lies within. Released on Valentine's Day, this anthology is a lovely collection of prequels penned by the authors of Write More Publications. 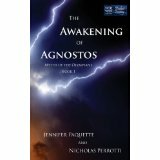 Setting the stage for the release of "The Awakening of Agnostos", Jennifer gives the reader a delectable taste of the lovelorn troubles of Aphrodite, Goddess of Love, as she pines for a mortal and unknowingly discovers Valentines Day. This heavenly collection features "An Angel Grows Up", Jennifer's sweet short story about a tiny but fiesty angel who earns her wings as a Guardian. However, she must first pass four stages of a very difficult test, with a surprising and very difficult subject. There is something for everyone in this zombie flash fiction collection of 54 bite-size tales. Jennifer's "Kiss of the Mer-Zombie" is sure to frighten anyone planning a trip on the high seas! There's always room for another zombie story! This horror anthology features Jennifer's first published short story, "Kiss of Eris", a chilling tale of zombies who are awakened from their icy graves by the radioactive kiss of a nasty polar goddess. Their trek down the frozen tundra wrecks havoc on everything in their path.